(JTA) — On the evening of Aug. 12, after two consecutive nights of clashes between police and protesters in Ferguson, Mo., Mikal Smith rose to address a community meeting in the neighboring city of Florissant. In front of Gov. Jay Nixon, Obama administration officials and community leaders, Smith spoke off the cuff about his own experiences as a young black man — the constant need to be aware of his surroundings, for example, and the indignity of being questioned by the police for no apparent reason. At the end of his speech, Smith, an incoming freshman at Saint Louis University, received a standing ovation. Smith, 18, is a recent alumnus of Cultural Leadership, a St. Louis-area organization that educates high school students about discrimination and social injustice through an intensive, yearlong study of Jewish and African-American history and culture. The program, which this month is celebrating its 10th anniversary, teaches how to work across racial and cultural boundaries to address social inequalities. With Ferguson now a flashpoint in the wake of the fatal police shooting of Michael Brown, an unarmed black teenager, Cultural Leadership’s curriculum is being played out in the national headlines. Meanwhile, its alumni are on the front lines in organizing a response. 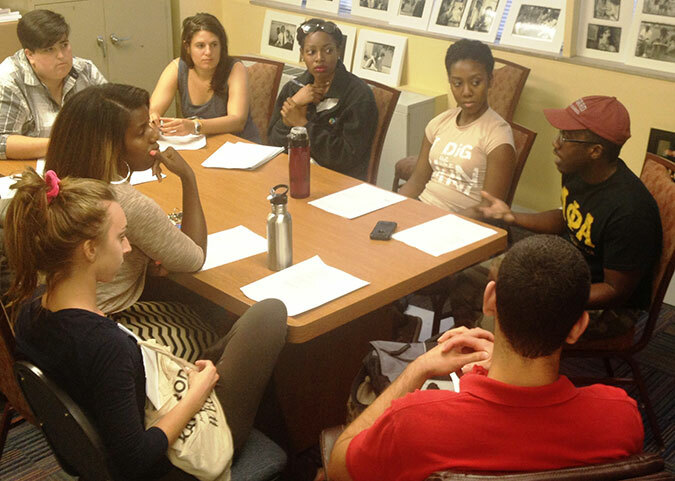 Aaron Johnson, a Cultural Leadership alumnus from its class of 2010, was organizing a training session for voter registration on Saturday in St. Louis and will lead a registration drive in Ferguson. Mary Blair, a member of the incoming class of 32 students, organized a walkout and silent protest at Metro High School in St. Louis that made the local news. Other alumni, who now number in the hundreds, have acted as runners for the community dialogue portion of the meeting in Florissant. Cultural Leadership recruits many of its students through local houses of worship, as well as schools and youth groups. The organization has close ties with St. Louis-area rabbis, ministers and school administrators, and those leaders often identify talented students and connect them with Cultural Leadership. The program was founded by Karen Kalish and modeled after a similar initiative, Operation Understanding, in Philadelphia and Washington D.C. Cultural Leadership was designed originally to bring together black and Jewish students to revive the historic black-Jewish alliance, which was particularly strong during the civil rights movement. It has since been expanded to include students of all faiths and backgrounds, though a significant number continue to be black and Jewish. The curriculum, however, has remained consistent. Over the course of a year, students study black and Jewish culture, history and contemporary issues. They also learn the history of social justice movements and community organizing basics. Students attend one another’s schools and houses of worship, and gather for a three-week trip to New York, Washington and civil rights landmarks throughout the South. On past trips, students have met Supreme Court justices Ruth Bader Ginsburg and Clarence Thomas, and Georgia Rep. John Lewis, a civil rights leader. Even the students who are neither black nor Jewish say the focus on those two groups gives the curriculum a powerful perspective on injustice. “You find those stories in a lot of other identities’ history, and of course one huge part of it is in the partnership between Jews and African-Americans,” said Wynn Hawker-Boehnke, a Cultural Leadership alumna who is white and Christian. Cultural Leadership recently launched a two-week summer camp for seventh- and eighth-graders. The Rev. Shaun Ellison Jones, chair of the Cultural Leadership board and himself a native of Ferguson, said the organization is also hoping to begin training counselors and students to lead St. Louis-area councils and peer groups focused on fighting social injustice. But expansion requires funding, and Cultural Leadership has had to struggle to raise its current annual budget of $300,000. The organization received significant funding from the Steven Spielberg-founded Righteous Persons Foundation in its first few years, and more recently a grant from the Natan fund. However, it now raises most of its money from local corporations, foundations and individual donors. Jones says he hopes that with the national attention on St. Louis, the organization will be able to find more funding. In the meantime, Cultural Leadership is gearing up for the coming school year. On Sunday it will hold its welcome party to kick off its newest class. Incoming student Mary Blair said she was inspired to join Cultural Leadership after watching her brother go through the program and become wiser and more open-minded as a result.